While Hulu offers users an easy way to catch up on the latest shows, it hasn't always given them the best tools to control that content. Scrubbing — or fast-forwarding and rewinding — had a history of inaccuracy, as well as a general uselessness. Luckily, Hulu has greatly improved this tool, updating it with new features to help you find your place quickly and accurately. Using the new scrubbing tool is both simple and intuitive. 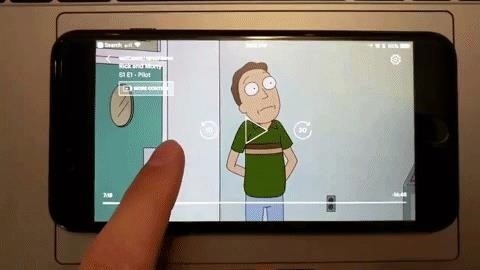 Simply long-press on any free space in the display while watching a show or movie to enter the scrubbing tool (on iPhone 7 and later, you'll receive haptic feedback when entering the tool). You do not need to touch the progress bar at the bottom to use the tool. As you move the tool back and forth, fast-forward or rewind arrows accompany a time-stamp to help you keep track of your actions. In addition, preview frames will appear as you skim, giving you a better idea of where you are in your show or movie. That's all there really is to it. Pick your finger up when satisfied with your place in time, and Hulu will load up your content. If you've gone too far or not far enough, simply repeat the process to find your place. Things weren't always this smooth. Hulu used to show no frame preview when scrubbing, which meant you had to guesstimate where you should stop when scrubbing. Even once frame previews were introduced, they were clunkier than they are now, with a less-than-ideal scrubbing UI. In summary, Hulu really tightened things up here.